Does the iOS (iPhone) App Require the "Always" Location Setting? To work correctly, the "Always" permission should be enabled. Rest assured, ClockShark only records locations when employees are clocked in. 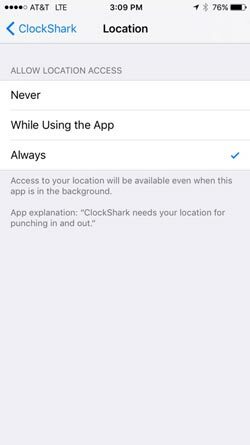 In the latest mobile release for iOS (iPhone), a permissions change was added that requires employees to grant ClockShark access to locations even while the app is not in use. This permission is only required if the enable GPSTrak Location Updates setting is turned on for the employee on the Employees Screen. The reason this permission requirement was added was to correct a problem where employers were turning on the Enable GPSTrak setting, but Employees were disabling the permission for ClockShark to access locations. Previously, this conflict defeated the purpose of the feature since it caused employers to not receive GPSTrak locations from many Employees and was leading to a bad user experience. 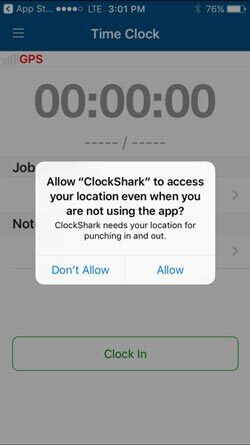 If you wish to allow Employees to work without this permission enabled for ClockShark to access locations "Always", you'll want to uncheck the box for "Enable GPSTrak location updates while clocked in via mobile". With that box unchecked ClockShark will no longer attempt to record GPSTrak location updates and will allow the Employee to use the ClockShark mobile app without the "Always" permission for ClockShark. Here's what the "Enable" checkbox looks like in the Employees Screen in the ClockShark website.